The regional planning agency’s proposal to take downtown land through eminent domain has encountered internal and external resistance. Officials will present all their options next week, so the board can decide whether going after the privately owned property is still a good idea. The San Diego Association of Governments thinks it can solve two problems at once by developing a new downtown high rise to serve as its headquarters. But it’s going to have to take land from private property owners to do it. The regional planning agency has for six years been pursuing a fix to a downtown eyesore. Dozens of Metropolitan Transit System buses park on the streets while drivers take breaks before returning to their routes. Temporary toilets have become permanent fixtures on sidewalks, so drivers have somewhere to relieve themselves. The agency has long pursued one plot of land to host all those things, but now SANDAG is thinking bigger. If you’re already buying a downtown block for a bus lot, why not put a new office tower on top of it? The tower could serve as SANDAG’s new headquarters, ending the agency’s need to rent space in its current home. It could be a landlord to other tenants, bringing in a new revenue stream. SANDAG has kicked around a number of ideas over the years, including ground-floor retail and affordable housing as part of the tower. It would cost $112 million, according to a 2016 estimate. 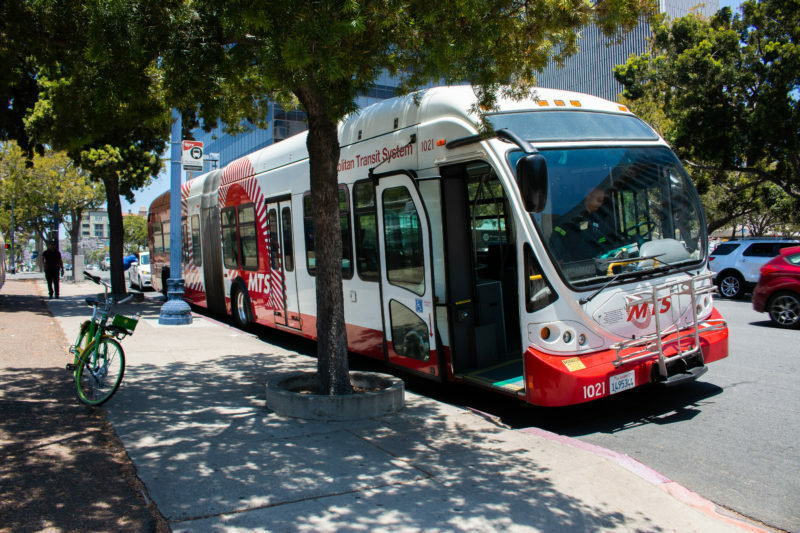 But SANDAG thinks the project could save the agency $26 million over 40 years, compared with leasing office space and building a standalone bus facility. A SANDAG spokeswoman said the agency is finalizing an up-to-date cost estimate for a Friday board hearing. The project is part of TransNet, the voter-approved sales tax and spending program that’s facing serious revenue problems. The problem is that the owner of the land the agency wanted wasn’t in the mood to sell. And at a November meeting, a handful of board members objected to the agency’s use of eminent domain to acquire it. Using the government’s power to take private property was a controversial move among some board members, led by San Marcos Mayor Jim Desmond. SANDAG needs to prove there’s a legitimate public use for the property. Once it does, it can force the owners to sell the land for a full, fair-market price. Board members voted down the plan to initiate the eminent domain process. They didn’t like that the eventual project could include a bunch of non-public uses. It’s not the first snag SANDAG hit with the project. The planned site is bound by A Street, B Street, Union Street and State Street. There are multiple owners on the block. One of them — the San Diego County Bar Association, a private group for the region’s legal community — is pushing back. It bought the land back in the 1970s, it argues, for the same reason SANDAG wants it: to serve as its eventual long-term headquarters. If anyone should get the right to develop it, occupy it and rent out the rest, it should be the Bar Association, that group argues. SANDAG doesn’t have the land yet, much less a break-ground date, but the project budget is already inflating. In 2016, the agency added $30 million to what it had budgeted just to acquire the property and do early design work, bringing that total alone to $45.9 million. As of November, SANDAG was offering a total of $35.7 million to the current owners — $12 million to the bar association for its portion. Since that November hearing, the bar association has released conceptual renderings of its own potential development. SANDAG had the property appraised and has offered the bar association the appraised value. SANDAG spokeswoman Irene McCormack said the bar association has made a counter-proposal in which it would lease the land to SANDAG for the project, but has not backed up its counter-offer with an appraisal. The dispute with the bar association is SANDAG’s current problem. Back in 2012, the issue was with residents. People living in Little Italy didn’t want the project near them. So SANDAG changed its plans, focusing on property closer to the core business area where it’s looking now. But back then, the idea to develop a tower was just a possibility for the future. At a 2012 hearing, agency staff said they’d build the bus lot right away, but mentioned that in the long term, they might eventually consider putting the lot underground and building a tower on top of it. In the time since, SANDAG has floated a handful of potential buildings to go on top of the bus layover area. Agency staff considered building just enough space for their offices, enough for them and a bunch of other companies, retail space on the ground floor and even a tower including housing reserved for low-income residents. But Coronado Mayor Richard Bailey, a SANDAG board member, isn’t sure any of those plans are necessary. He agrees the current situation is untenable. Having temporary bathrooms scattered on downtown sidewalks for bus drivers doesn’t make any sense, he said. But Bailey can’t figure out why SANDAG hasn’t tried to strike agreements to pay downtown building owners to let drivers use their restrooms, find existing parking lots to put the buses in, or in a worst-case scenario, continue to let MTS park its buses on the street, because it’s allowed to paint curbs red so they’re unavailable for on-street parking. “You can spend $60 million on a bus parking station, or buy a few gallons of red paint,” Bailey said. The project does have enthusiastic supporters. Another board member, Imperial Beach Mayor Serge Dedina, has been a proponent for years. “I think it’s brilliant public policy, I think it’s smart government and I’m proud to be a part of it,” he said during a September 2016 hearing on the deal. Assemblyman Todd Gloria, who was a SANDAG board member when he was on the San Diego City Council, was cautious early on. He questioned a chart in a staff report that showed developing the property could save money, compared with just building a bus lot and continuing to rent office space. “I’ve seen this chart before for another project, and it wasn’t true — I’d like to know more,” he said in 2013, referring to an old plan to build a new City Hall. He also emphasized that being a landlord is risky, referring to a similar plan the San Diego Housing Commission had for its East Village building that didn’t work out. But once staff quelled resident concerns by moving the project to the core business area, Gloria embraced the idea. SANDAG itself had previously acknowledged that taking private property isn’t easy or ideal. In 2015, the agency zeroed in on the next block over as the ideal site for the bus project and office tower. That land is owned by San Diego County, which made the land available to other public agencies. Former SANDAG director Gary Gallegos told the board it made that property a better option than the one it’s currently pursuing. A year later, though, negotiations with the county fell apart because the county wanted to lease the land to SANDAG, not sell it. That didn’t work for SANDAG, so the agency turned to the option that would likely lead to eminent domain. Bailey said he recognizes that once the agency owns land, it’s financially prudent to develop it. But he can’t get past that doing so means depriving the current owners of their right to do the same. Desmond, Bailey and others won out in November. The board voted down the proposal to formally declare a public need for the land — a necessary step to eventually taking it. SANDAG’s attorney got a bit exasperated at their concerns. He emphasized that anyone who loses their property will be made whole. They wouldn’t get to develop the property, but they’d be compensated based on the so-called highest and best use of the land — in this case, they’d be paid as if the property was destined to become a high rise, not just a parking lot. And County Supervisor Ron Roberts said he’d had it with the board getting squishy every time it needed to pursue a “resolution of necessity,” the first step in taking private land. That — from both SANDAG staff and Roberts — didn’t sit well with the bar association. Before a government agency can take private land, it first needs to formally declare that the public needs it. That’s the start of a legal process that ends with the land going to the agency, and the property owners receiving whatever is determined to be the fair market value of the property. But that formal declaration of need isn’t just the first step, as SANDAG’s attorneys and Roberts have suggested, said Ellen Miller-Sharp, the bar association’s executive director and CEO. It’s the most important step, since once it’s done the agency can go to court to ask for the property. “It was an extraordinary misrepresentation,” she said. In an email, McCormack said parties “can and typically do continue to negotiate a potential acquisition short of a trial” over the proper compensation. But in the aftermath of the vote not to initiate that process, it appears SANDAG has hit the brakes. The project is scheduled to come back to the board on June 22. But it won’t be a hearing to initiate eminent domain. SANDAG will instead present all of its options, including some new ones, so the board can tell staff whether it wants to keep going after the privately owned block. That could be music to Desmond’s ears. 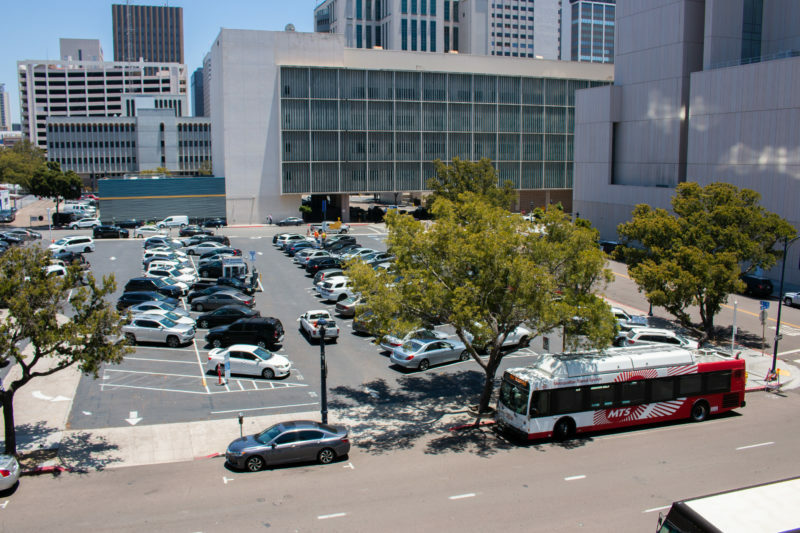 He floated the idea of partnering with the bar association and other property owners — SANDAG gets its bus parking and office space as part of a joint deal, and the bar association is a partner in the development deal. In the past, that hasn’t interested SANDAG. Miller-Sharp said they floated that very thing in meetings and were rebuffed. Maybe that will change now that seven years later, and with buses still on the streets and toilets still on the sidewalk, SANDAG staff is still laying out a menu of options to its board. Sergey Kagermazov contributed to this report.